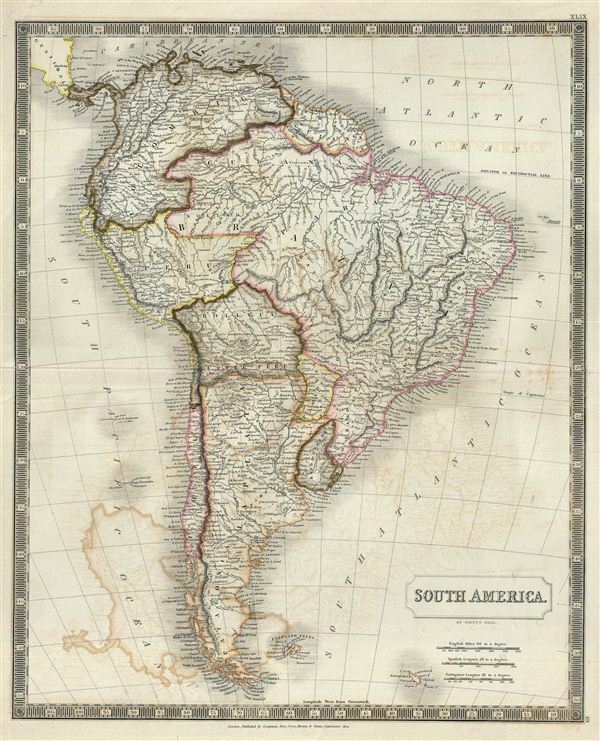 This is a beautiful map of South America from Sidney Hall's extremely scarce 1835 New General Atlas. It covers the entire continent from the Caribbean to Tierra del Fuego and from the Pacific to the Atlantic, including the Falkland Islands. It includes the modern day nations of Colombia, Venezuela, Ecuador, Uruguay, French Guiana, Guyana, Suriname, Brazil, Peru, Bolivia, Paraguay, Chile, Argentina, and the Falkland Islands. Ecuador, Venezuela, and Columbia are united under the ephemeral Grand Columbia. Bolivia's claims to the Atacama Desert and Peru's claims to the Tarapaca region - both of which are today part of Chile, are shown. Chili extends southward only to the border of Patagonia. Guyana is shown with British, French and Dutch divisions. The map also covers the modern day country of Uruguay and part of the Rio Grande Do Sul region in Brazil. These territories were known as the Banda Oriental or Cisplatina region before the 500-day Cisplatine War and are here noted by their original names. The 1828 Treaty of Montevideo following the Cisplatine War gave birth to Uruguay as an independent state. Very good. Minor wear and verso repair along origianl centerfold. Original platemark visible. Some offsetting, especially in lower right quadrant. Rumsey 4224.050 (1830 edition). Philips (Atlases) 758.